Skyteam will open its first co-branded alliance lounge at Heathrow T4 later this week, and Business Traveller had a sneak preview of what guests can expect. The new lounge, which opens on Thursday June 4, is spread over two of the three floors previously occupied by the BA lounges at the terminal (the lower floor will open as an Etihad lounge in late summer). The lounge will open with one floor initially, with the upper level due to come into service in November when further Skyteam carriers start to move across to the terminal. This forthcoming section will house two VIP lounges, a quiet room, and a children’s area, as well as further seating and F&B offerings. When the two levels of the lounge are fully operational it will have seating for 340 guests. 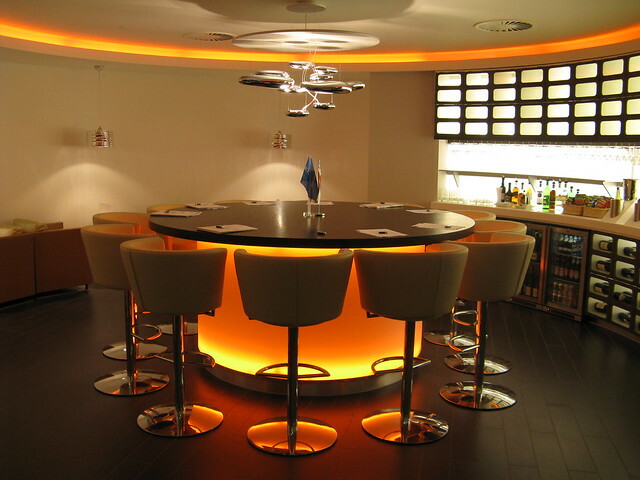 First impressions of the ground floor area are of a modern, funky lounge, with trendy designer furniture, plenty of curved lines (designed to express the looping ribbon present on Skyteam’s logo), and soothing orange lighting throughout. The standout feature has to be the Vertical Garden on several of the lounge walls. Designed by French botanist Patrick Blanc, who recently created a similar outdoor offering on the side of London’s Athenaeum hotel (see online news May 28), these “living walls” are a clever use of limited space, enabling 60 different species of plant to grow without the use of soil. They will continue to grow after the lounge opens, and over time will create a indoor jungle effect on the walls. Located opposite gate 10 and open from 0530 till 1030 daily, the lounge features free wifi throughout, a business centre with two terminals and further hot desks (with international power sockets), a self-service champagne bar, a hot and cold buffet station, a games area, and several seating choices. There is also a 130-sqm wellness area, with five showers, an oxygen bar and massage chairs. There are also several treatment rooms which will open once a spa partner has been finalised. At present the lounge will be used by passengers on Continental, Delta, KLM and Kenya Airways flights, until further Skyteam carriers start to move into the terminal later this year. For more information visit skyteam.com, and to see images of the lounge taken during Business Traveller’s visit, click here. It’s been a busy few weeks for lounge openings at Heathrow. BA recently unveiled its new facility at T3 (see online news May 6), and Bmi today opened its new T1 lounge (see online news June 1).